I have never ever ever been so close to selling up everything MLS! Literally unplayable and they’re zero fun right now. Starting my pointless Ibra journey later. You might have more than that depending on what you sell. I literally cashed out my entire club, consumables included. I have just shy of 2.5 mill now. honestly I just want our transfers. Shame they still don't have that done......Lletget would be a good shout though. Lletget would be fun for sure. A defender would be nice too though. Could you imagine an 85+ rated Opara or Lawrence?? That escobar would be op af!!! Accam in TOTW. Kind of pointless at this point in the game though. Yeah. Would have thought zimmerman or hollingshead would be in with a shout but guess not. Accam looks fun, but we also got IF Gerso who is very similar, and SBC Piatti who is better than both. at this point of the game the only people buying that one are Union fans. anyone else given CB Zlatan a run out? only got one game with him so far and he seemed pretty clinical in tackling. 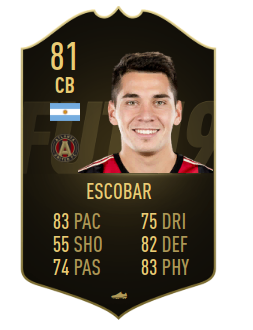 A bit slow and not the best positionally (probably due to his low marking and M/L work rates), but kinda fun. I doubt I'll stick with this though. FB Zlatan up front has a much much larger impact. Pozuelo is giving me vintage Giovinco vibes. That chip was magisterial. Hope he gets an IF next week, not that we need another CAM.